Look no further for the ultimate sweet and salty treat. 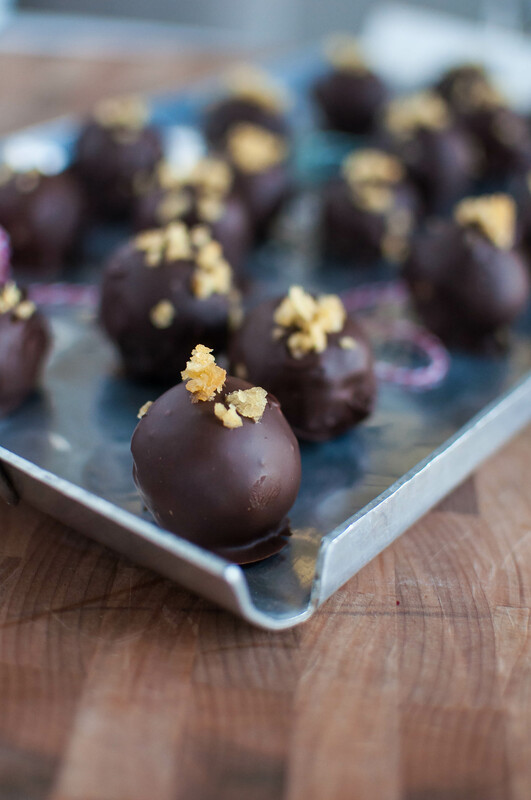 These Peanut Butter Potato Chip Truffles will be the biggest hit of your Christmas cookie tray. Hey friends. It’s been a little while since I popped in. I took a little break over Thanksgiving then this week has been spent completing the final preparations to put our house on the market. It’s open the next few days for private showings before it officially goes on the market Friday. I haven’t had much time for blogging but don’t be mad because I’m coming back with pretty much the best thing ever. I combined a few of my favorite things to make the ultimate candy for Christmas. I haven’t been this excited to share a recipe in a long time so that should tell you just how incredibly they turned out. If you’ve been around for a while, you know I’m not a huge sweet person. I mean, I like dessert and I’ll eat it but just a little and I’m good. I would just rather eat a handful of potato chips. So with that in mind, I took my favorite salty snack and got to brainstorming. One dessert that I do completely and utterly adore is peanut butter bars, especially around the holidays. I knew the only way to make them better is to add some crushed potato chips to the mix for that glorious crunchy, salty bite. I wanted to make something a little more festive and pretty for a cookie tray so instead of bars, I decided to turn them into truffles. This makes for more time and effort but the end result is soooo worth it. And that is coming from a person who completely despises dipping things in chocolate. The texture guys. Creamy yet crunchy with that thick chocolate coating. And the potato chip sprinkle on top. I just can’t. I had to give most of them away then hide the rest in the depths of the refrigerator in hopes I would forget about that. Didn’t work. Shocking I know. I hope I haven’t lost you guys with the combination because I wasn’t sure when I first tried chocolate dipped potato chips either but please trust, it’s a very very good thing. I’ve even made a simple kettle chip bark which is literally two ingredients and so dang delicious. Line a large cookie sheet with parchment paper. Set aside. Mix together graham crackers, 1 cup potato chip crumbs, butter, peanut butter and powdered sugar in a large bowl. Using a tablespoon, scoop out a rounded amount of the peanut butter mixture and roll it into a ball. Place on the prepared cookie sheet. Continue until the mixture is gone. Place the cookie sheet in the freezer for 15 minutes to allow the truffles to set up and harden a bit. Place the chocolate chips in a microwave safe bowl and microwave in 30 second increments, stirring each time, until just melted. Dip truffles into the chocolate and roll around until coated with two forks. Remove truffle from the chocolate by scooping under it with a fork and tap on the edge of the bowl to remove any excess chocolate. Place back on the parchment lined cookie sheet and sprinkle with the reserved potato chip crumbs. Repeat until all the truffles have been coated. Place in the refrigerator for 30 minutes to allow the chocolate to harden. Store in an airtight container in the refrigerator. These truffles look so yummy! I love the addition of the potato chips! I can understand where you have to give them away so you don’t eat them all! I wish I could be that disciplined! Unfortunately, I’m quite certain I would freeze them and not give any away! Thanks for sharing the recipe, Meg! Thanks Deb! The sweet and salty combo in these is the best! Freezing them is definitely a good idea! I may have to do that next time! !